One of the things children enjoy most about springtime is the arrival of butterflies. They can’t wait to see their first butterfly so they can chase and catch them, only to let them go. To enhance your child’s enjoyment this spring, you can learn how to attract butterflies into your garden by considering the plants that are there. Gardens that attract the most butterflies are those that are colorful. They have fragrant flowers and use no or minimal chemicals so the butterflies will have a safe area to visit. Butterflies also like gardens that are near the tree line, so you might want to consider a specific location near trees for your butterfly garden. Since many butterflies are searching for an area for their larva, your garden will need a variety of flowers and plants for both the caterpillars and adults. Don’t expect a large variety or number of butterflies the first year or so. More butterflies will visit your garden as your plants, flowers, and bushes grow to maturity. 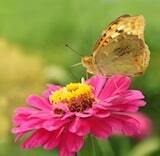 Be sure to incorporate areas that can act as shelters for butterflies during stormy weather. The trees and shrubs in your garden will provide this shelter during rainy weather. Group the plants together to make it easier for butterflies to find your garden. They’ll enjoy the open areas of your lawn and garden during the warmer, sunny days. To increase the chances of attracting particular butterflies to your garden, knowing which types of plants they prefer can help you decide how to design your garden. If you prefer Black Swallowtail butterflies, be sure to include herbs such as parsley, dill, or fennel. Fritillary butterflies prefer Lupine flowers, and Snapdragons will attract nearly any butterfly that is native to your area. * Bee Balm-This flower has red or purple blooms and grows well in zones 4-7. * Butterfly Bush-These bushes grow up to 12 feet tall and spread out to nearly 15 feet. They need well-drained soil with direct sunlight. It is suggested that they be cut back each winter. Flowers will vary in color and can be pink, purple, red, or white. * Fern Acacia-This plant attracts both adult butterflies and caterpillars. It is a low-growing shrub with white flowers and grows well in zone 8. * Larkspurs- These plants grow relatively tall, reaching over 5 feet. They are popular in zones 2-9 and come in a variety of colors. * Mimosa (or silk tree)-This has pink aromatic blossoms. It is a tree that grows well in zones 6-9 and will attract both butterflies and hummingbirds. * Red Columbine -This perennial flower has red and yellow flowers that droop. They are easily grown in zones 2-8. * Rose of Sharon-This shrub can grow to 8-10 feet tall. It can be found with red, pink, blue, and white blossoms. It grows well in zones 5-9. * Trumpet Honeysuckle-This creeping vine has red or scarlet flowers. It can be found in zones 3-9. Don’t forget to include wild grasses and native plants in your garden when you want to attract butterflies. You’ll also want to include a water element so the butterflies can find ample water. If you plant some of these flowers as well as include these other ideas, you’re sure to attract butterflies into your garden. Who knows, if they have everything they need, they may not want to leave.